It might rain this morning, so I'm waiting for that to pass. We'll be thrilled if it actually does rain though. I did get the 2nd coat of paint on the garage doors last night, and it looks like it won't need a third coat, so I'm done with that. If it doesn't rain on my porch posts, I'll do one more coat of primer to cover the patched areas, and then the topcoat and they will also be finished. Then I'll help hubby mark the deck dimensions and where the posts will go, then we'll dig out the old concrete piers. Not sure we'll get anything more than that done today. Depends on rain timing I suppose. Finally I have a couple flats of 4" perennials to plant, they were clearing them out at $.50 each. I can never pass that up. 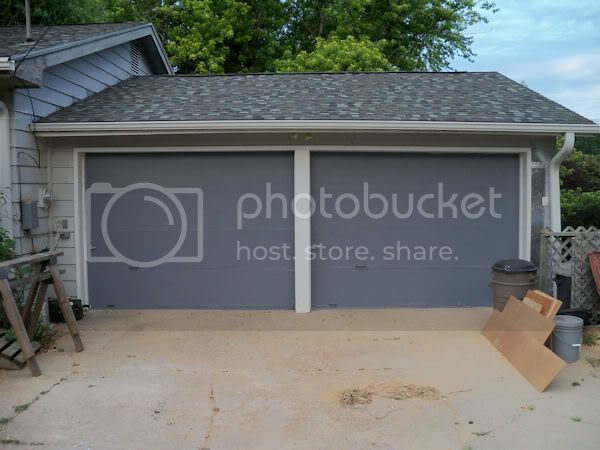 The garage doors look like new and the colour is really attractive. It sounds as though you have another busy day ahead of you but do try to take a break now and then. We don't want you to injure yourself with overdoing things. Looking good ... I really like that color! I wish I could find perennials for .50 each ! !